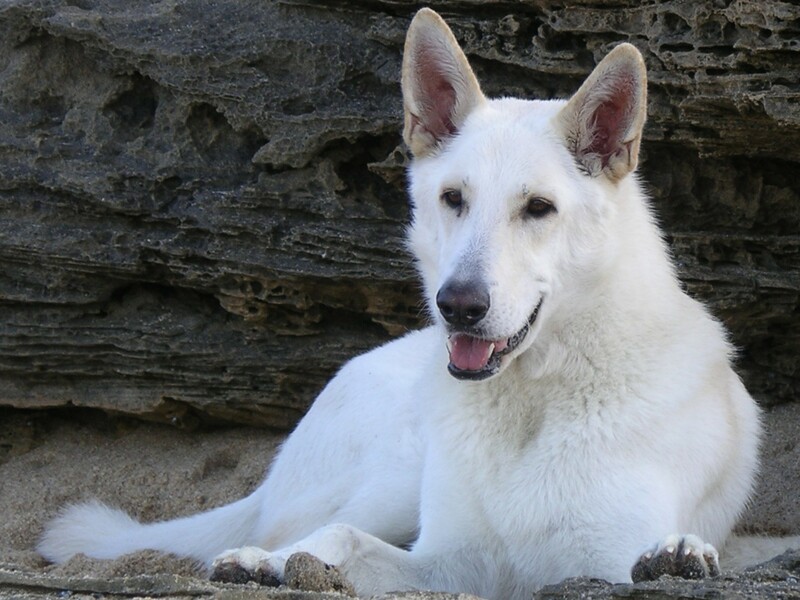 The White German Shepherd is a beautiful and often misunderstood breed. 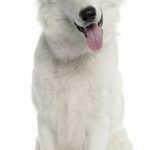 I am here to put a few things straight, and I think the best way to do that is by putting forward questions I often hear about this dog and giving you accurate answers! So keep reading to find out more about this wonderfully white dog! 1. 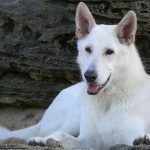 Is the White German Shepherd a separate breed to the standard German Shepherd? 2. 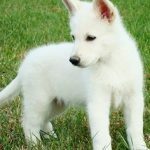 White German Shepherd vs standard German Shepherd? 3. 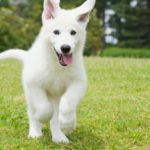 What makes the White German Shepherd white? 4. 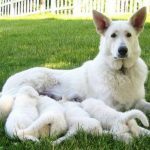 Can a White German Shepherd produce standard colored offspring? 5. 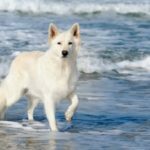 Does the White German Shepherd have genetic disorders? 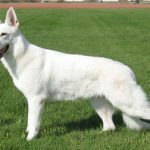 The recessive gene that causes this breed to be white has always been present in the original genetic structure of the German Shepherd – White German Shepherds descended directly from German Shepherds. 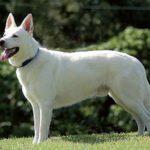 Since the 1930s, however, the White German Shepherd dog has been considered a fault and has yet to be recognized or accepted as a type of German Shepherd. 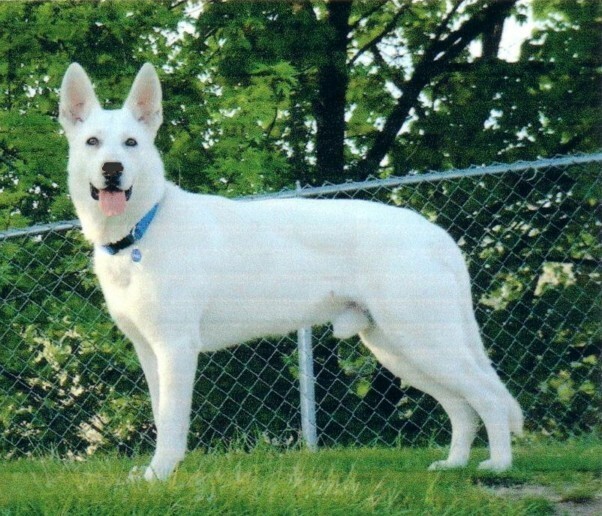 Supporters of the breed began forming their own breed clubs and registries for this dog in the 1970s, and eventually, in 1999 the United Kennel Club (UKC), the second largest dog breed registry in the US, recognized the White German Shepherd as a separate breed. 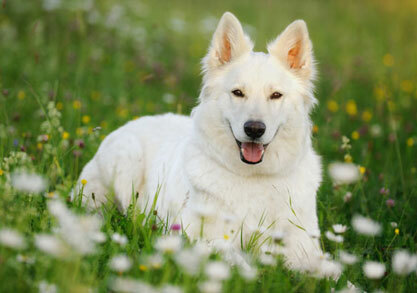 Like the Black German Shepherd, the White German Shepherd is the product of a recessive coat color gene. 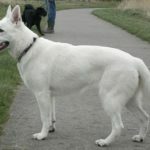 Unlike the Black German Shepherd, however, whose true color is solid black, the recessive white gene acts as a mask, blocking the dog’s true color and pattern and causing it to appear white. 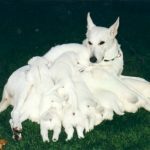 The only way to get 100% solid white offspring is to breed two White German Shepherds, but if a White German Shepherd is bred to a colored German Shepherd, they will throw colored puppies. 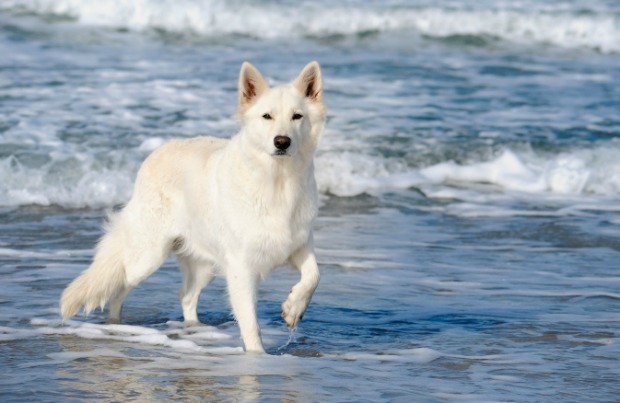 What proportion depends on whether the non-white Shepherd also carries the recessive white gene. 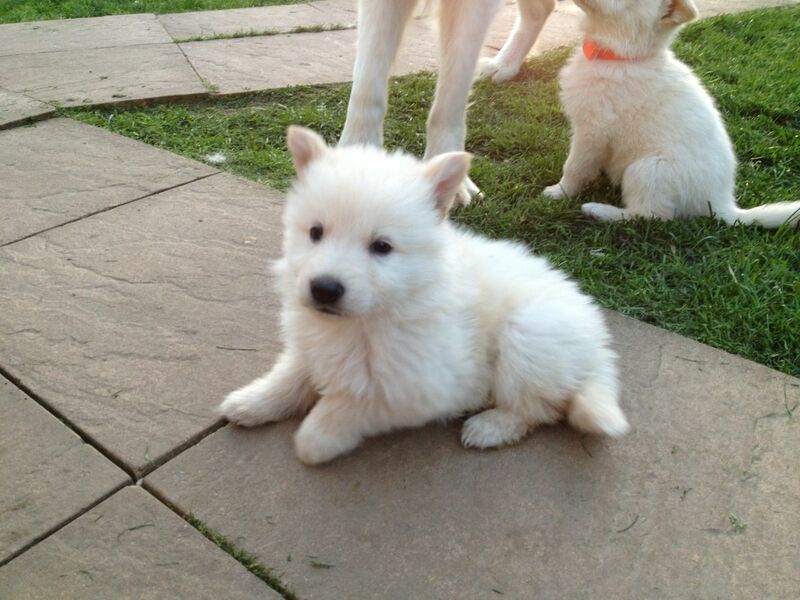 If the non-white carries the recessive white gene, the puppies will have a 50/50 chance of being white or colored. 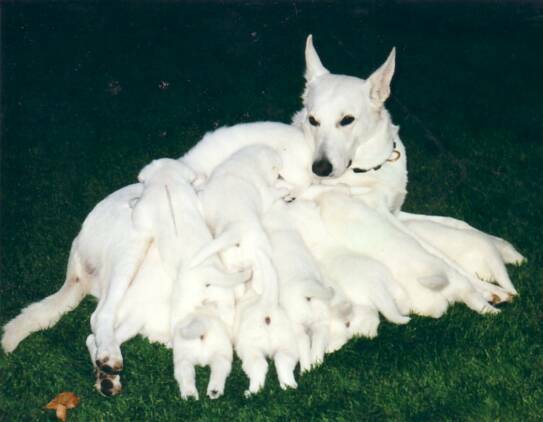 If the non-white doesn’t carry the recessive white gene, all the pups will be colored. 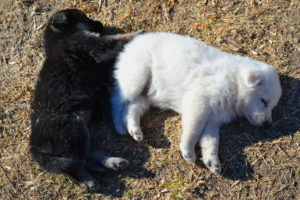 Given that we cannot know what color or pattern a White German Shepherd is masking, it is not easy to determine what colors the pups will be when bred to a non-white German Shepherd. Unfortunately, though, history has been unkind to this breed, and today people still have the idea that she is flawed genetically. I’ve heard people refer to the White German Shepherd many times as an albino German Shepherd. 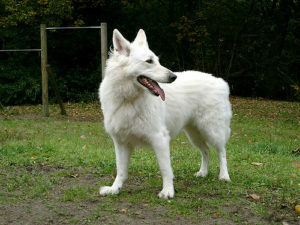 While there are albino German Shepherds, the White German Shepherd is not an albino dog. An albino is an organism that has deficient pigmentation, which causes pink eyes, pale skin, and colorless hair. 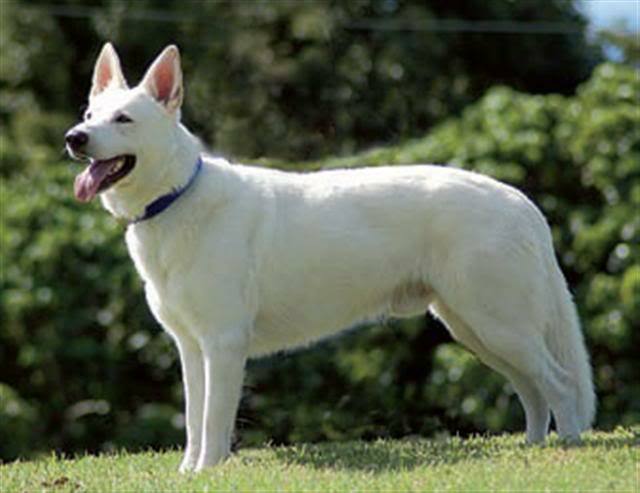 The White German Shepherd has pink or black skin, gold or brown eyes, a dark nose and solid white fur. 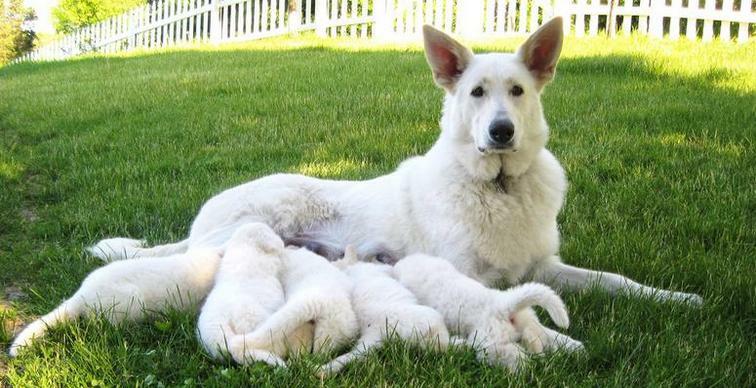 Some people think that if you breed a White German Shepherd with a standard one, the white gene will cause the puppies to be born a lighter color. This is not the case, however. 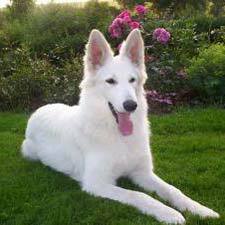 The white gene is not a dilute gene, like liver and blue; it is a masking gene (meaning the recessive gene masks the dog’s true color). 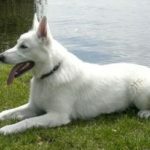 The only way for diluting to happen is if the White Shepherd in question is masking a diluted color like liver or blue. The recessive gene is only responsible for the dog’s color; there are absolutely no links to poor health or temperament. 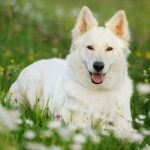 The White German Shepherd is prone to the same health issues as the standard, the major concern being hip and elbow dysplasia. Unfortunately, not unlike the case with the Black German Shepherd, some breeders are just in it for the money. 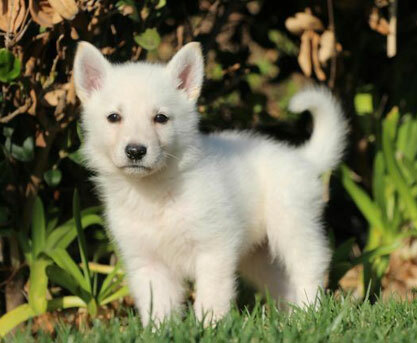 As these dogs are relatively rare, breeders can charge more for a White German Shepherd puppy. 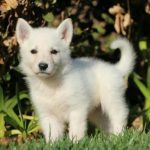 While the average puppy price for a standard German Shepherd starts at about $300 and goes up to $900, White German Shepherd puppies cost between $750 – 1000. It is very important to search for a responsible breeder and know how to recognize one. 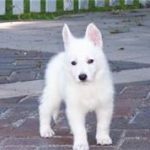 They should be able to provide you with full details on the puppy’s parentage, any health issues and details of the puppy’s vaccinations. 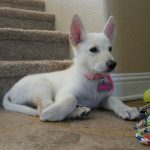 They should want to meet with you to ask you questions about your experience as a dog owner and why you think you’d be a good match for the White German Shepherd puppy. To find a trustworthy breeder, check out The American White Shepherd Association, the largest White Shepherd dog club in the US. 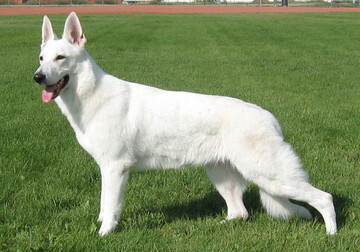 They provide links to White German Shepherd breeders all over the US and Canada, all of whom are members of the club. She is recognized as a separate breed to the standard. Physical differences include: a white coat that is usually longer and may not be double. Her white color is caused by a recessive ‘masking’ gene that hides her true color and pattern. She is no different to the standard German Shepherds in terms of temperament, life span or health. She can produce colored German Shepherd puppies. Let’s change people’s minds about this beautiful dog – go and spread the word! 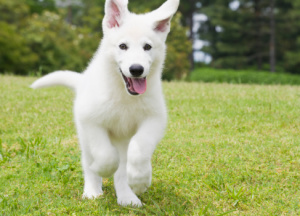 Got something to say about the White German Shepherd? Comment below! Ill bet she is, we have a black male German Shepherd we always say best dogie in the world. 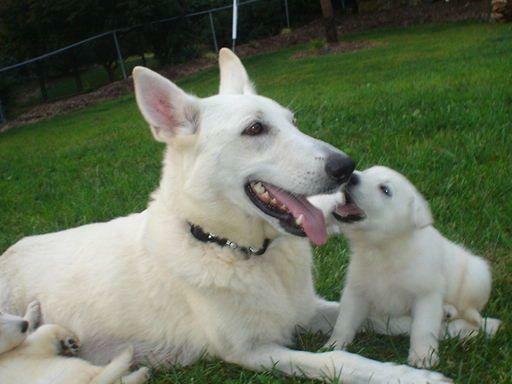 White German Shepherds are great dogs. Enjoy. 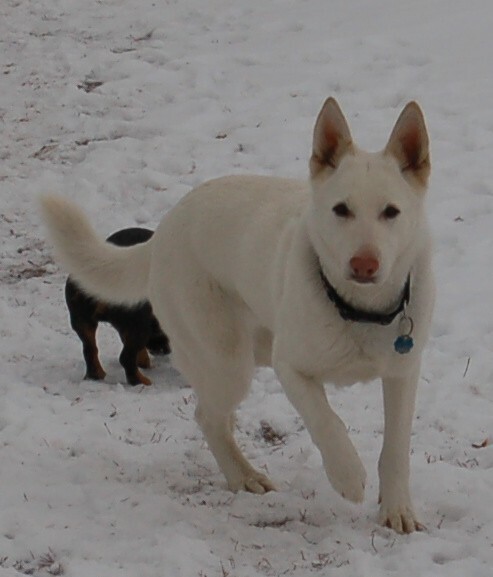 we adopted a white german shepard is name is sam and what an awesome dog good watchdog ! 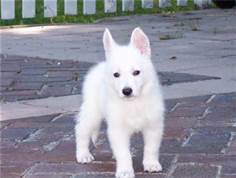 this is our first white german shepard we always have had the black and tan took some adjustment to get use to the white i think sam is different and i like that. thanks for your info i learned alot. We adopted a one year old-ish White German Shepherd from an animal shelter. He had lots of issues, obviously related to abuse and neglect. We have had him for 5 years now. We love him dearly. He still has some of the issues (very wary of strangers; goes crazy at loud sounds), but he is overall a wonderful pet. 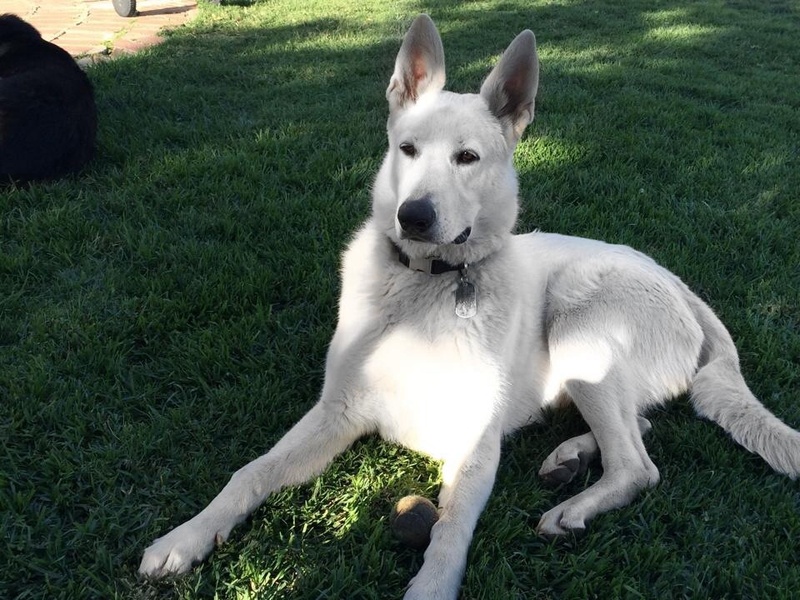 I just adopted a white GSD (possibly mixed and around 2 years) recently and he unfortunately has some issues from abuse and neglect as well. But he also seems like a really sweet dog but he has some weird habits that I wonder what caused. You can rarely hear him barking, doesn’t growl, rarely even whines unless it’s in his sleep. I was just wondering if yours did that in any way. Dan, I have had German shepherds my whole life, and 3 of them were whites. You mentioned your dog goes crazy at loud sounds , well I’ll tell you that ALL 3 of my whites went crazy at loud noises, the worst being the garbage trucks, so that is something that will always be apart of him. I speak from 25 yrs of dog training, I have tried everything to stop or ease the fearfulness of loud noises. As for being wary of strangers, German shepherds are a naturally aloof towards strangers. 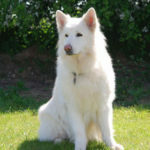 We have a beautiful white shepherd , he is very loyal and affectionate, he mumbles and grumbles and howls. loves the sea and beach and digging in the sand(and water!) He can say “I love you”, eager and easy to train. He also loves catching bubbles! Hasn’t always been good with other male dogs who have a high energy, a kind firm hand is needed because they will always test you! (so smart) I run with him , so lots energy required. he is my soul buddy =) , his shape looks like the original first German shepherds like Greif von Sparswasser , I love my white Kebla Khan. 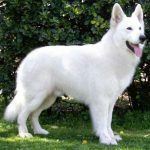 Is it possible that a white German Shepard’s weight could be 24 lbs? 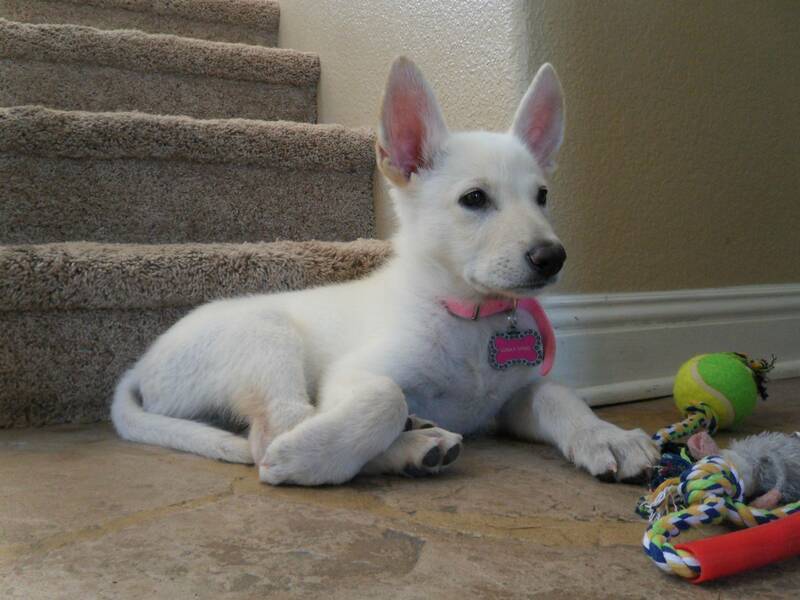 She has all the characteristics of the White GSD, sheds like crazy, howls, gold eyes, pink skin, she is just smaller sized. She is not perhaps as shaggy as some of the dogs pictured. Very obedient, affectionate, but not underfoot. I have not seen any comments that mention a smaller sized dog. 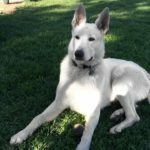 We just rescued a beautiful 2 yr old white dog that the shelter staff thinks is a German shepherd/husky cross because of his GSD look, but white coarse coat (some golden areas, especially his ears). I’m starting to wonder if this constantly shedding, sweet, good natured boy might be a white GSD. We adopted our white shepherd from the animal shelter a couple of months ago. She’s about 1 year old now, and is still very puppyish. Quite the STRONG chewer, I have given her the nickname “chainsaw”. I can’t believe how loving and smart she is. She is really friendly and extremely playful. We had a black Lab and a brown/black German shepherds and her personality seems to be a cross of the two. What an absolute joy this girl is to our family. I have had Golden Retrievers in the past and wanted to try something different. 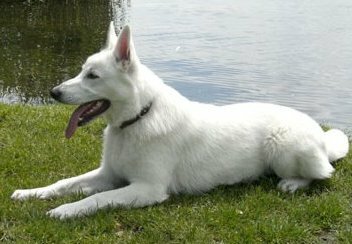 I have had two White German Shepherds for about three years and will probably have them the rest of my life. They are very smart, loyal and loving. 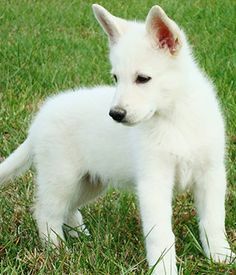 I think white German Shepherds are very beautiful, however the one my family adopted was aggressive especially toward children. Not sure if she was abused before we had her or not but she was a bit wild. Anyone else experience this?? Daisy is a wonderful girl in her twilight years and we will miss her very much when she leaves us… it’s been worth every minute. 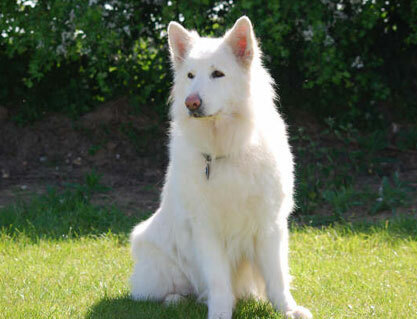 I have a white German Shepherd, he’s so beautiful. He’s very intelligent and loves his family. 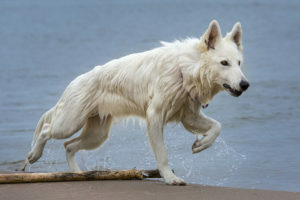 I was reading about the “breed” and an article said that white shepherds are characterized by self-confidence, and that a timid or aggressive dog at maturity is uncommon. My dog is 2 years old and is friendly but also very timid. Around strangers, he can be extremely aggressive, growling and barking whenever we have guests in the house. He especially does not like strange men. 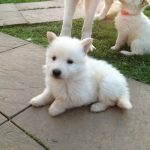 We looked around to various different breeders because we were interested in buying a white German shepherd we found a breeder which interview just before has buying our dog we could not be more happier with him he is such a loving so he loves all the attention of people you could not ask for a better companion and I would highly recommend the white GS as a household pet we have no regrets in having hours there is not a day goes by but he does not make you smile in some way or another. 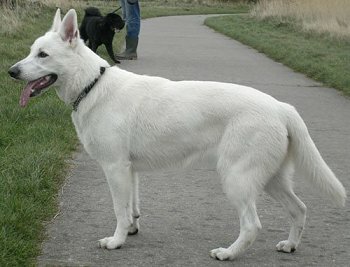 I have two beautiful white German Shepherds. The first one acquired by accident. Someone was selling him and his siblings on the side of the road. I thought he was a white lab until I got closer. The mom dog was stunningly beautiful but most important, calm. I fell madly in love. They are intelligent, loyal, affectionate, and full of personality. I would not have another breed, despite that they shed 365 days of the years. Warning – they are puppy-like until about age 2 +. You must walk, challenge, and play with them. They are the best companions and very intuitive. Greetings. I own two cats and wish to get a year and a half old female white GS. I am a teacher and don’t work from home. How can I give my three pets a healthy and happy life. For now I live in an apartment. I have had these dogs since I was about 2yrs old. I have 2 now. They have their own loyalty, so make sure you socialize them, so they dont get too protective. Sensative and fun. You can teach by playing with them because they are so smart! Hand commands too! They are limitless with love and intelligence. Still the best dogs ever! (If you crate them remember it can stunt their growth if left for long periods) I never have but have seen it.. i have one that was left like that and was afraid of noises, wind, gunfire, stuff that im still working on after having her 4 yrs. they dont forget easily, so be patient. 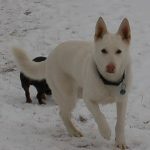 I have a rescue white German Shepard Ike he is my second white one. He is an incredible dog. I could not ask for a better more loyal companion. I do take him everywhere. He is always the center of attention but at 105 lbs weight he is quite impressive. I just love my big boy!! I inherited him from my ex, but I couldn’t ask for a better dog. He has seen me through it all. He even drove cross country with me from Wisconsin/Illinois to Los Angeles. It sounds crazy but my big boy Taurus has been my rock always there to cheer me up or just hang out with his mom!! He has a gorgeous coat and his stance shows everyone that he is very much in charge. He doesn’t have a slop in his back. He stands up and he’s eye to eye with me and I’m 5’4 and his weight is about 110 lbs. his coat is long and thick with a big mane around his neck, and head with feathered hair down his legs. His tail is beautifully feathered and bushy but it can be watch out you don’t want to get hit with it… it’s actually quite painful. My baby just turned 8 yrs old April 27 and I’m realizing that I may only have him for few more yrs if I’m lucky. 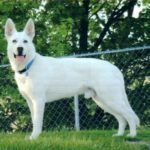 I grew up with white German Shepherds and that has been over 50 years. 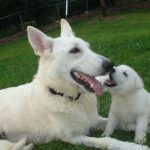 I currently have 3 white German Shepherds and love them dearly. That said I love all German Shepherds. 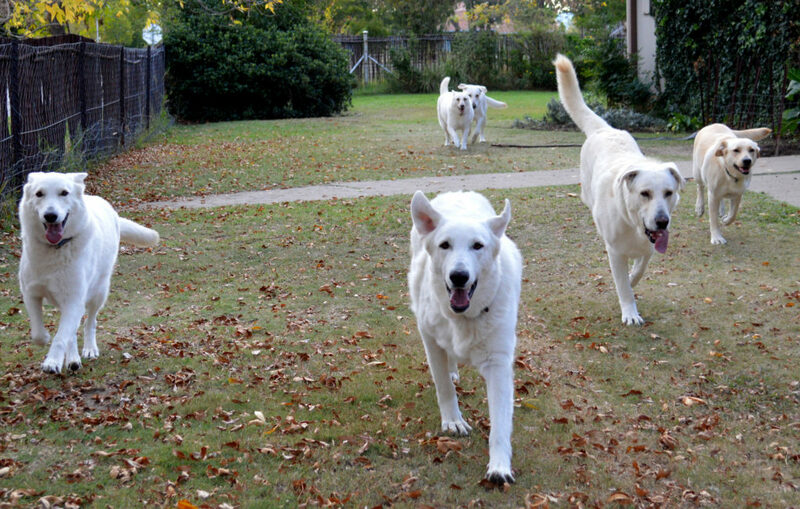 I absolutely love all my white German Shepherds. I have a white GSD who is the best dog I have ever had. very loyal the only problem I have is when I come in he starts crying, howling, jumping makes me feel bad I have to leave him. when I go to work. what can I do to help him get over his high anxiety while I’m gone.